Several projects are slated for the north Phoenix area in the near future. Plans to attract hundreds of new residents to the Kierland area of north Phoenix are taking shape, as developers reimagine traditional shopping centers as high-end, urban projects. First to finish with a grand opening Thursday is the initial phase of Optima Kierland, a 10-story apartment tower at Kierland Boulevard and Scottsdale Road. Down the street, construction started last month on 170 rental units for active adults ages 55 and older. And landowners recently submitted plans to Phoenix to turn a 15-acre shopping center north of Thunderbird Road into a mixed-use destination. Developers say the Kierland area — on the Phoenix-Scottsdale border near Kierland Commons and Scottsdale Quarter — is moving away from suburban retail and residential projects. Some existing neighbors, though, want to make sure they aren’t disrupted by the changes. The most recent proposal calls for redeveloping an aging strip mall on Scottsdale Road and Acoma Drive into “Acoma Court,” a hub of uses like offices, restaurants and apartments. The center houses businesses including Goodwill and Sauce Pizza and Wine. A new vision would apply some characteristics of Kierland Commons and Scottsdale Quarter to a commercial center that can be hard to fill, said Bill Lally, an attorney representing the project. Development is transitioning away from big shopping centers dominated by parking lots, Lally said. Instead, people are looking for places with different types of uses on a more walkable site. “It’s a totally different way retailers are looking at retail shopping centers today,” Lally said. Acoma Court’s hallmark would be a plaza featuring 100 palm trees “filtering sunlight and creating shadow patterns” around Sapporo, an existing upscale Japanese restaurant, according to plans submitted to Phoenix. Open space, outdoor dining and walkways would surround it. The rest of the center would include additional retail, offices, apartments or a hotel. The developer is asking Phoenix for zoning allowances for the land before filing specific building plans. The plans, though, would be a big change for an older, quiet shopping center, said Amy Satterfield, president of the adjacent Desert Paradise Estates Association. Satterfield said it’s too early to speak on behalf of the neighborhood, but that she and many of her neighbors have concerns. The height of new buildings — originally proposed as up to eight stories — is out of place in the neighborhood and would limit the privacy of houses nearby, Satterfield said. Other issues include a potential increase in traffic, she said. Scottsdale Mayor Jim Lane also expressed concerns in a letter to Phoenix City Councilman Jim Waring, who represents the area. The land is within Scottsdale Airport flight paths and could expose residents to related noise, he wrote. Developers are planning to limit building height based on conversations with neighbors, according to project representatives, and will host open houses on the proposal. It could take a few years to see significant changes on the site, Lally said. Other projects in the area are nearing completion. 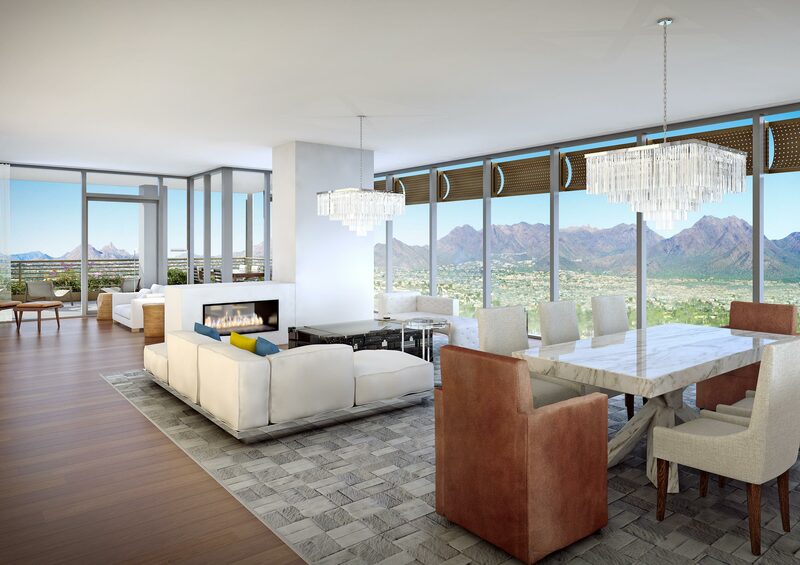 Optima Kierland expects its first residents in April. The more than nine-acre site used was recently a furniture store and other retail. Developer Optima saw an opportunity to transform a parcel near popular shopping and dining, President David Hovey Jr. said in an email. The company’s projects, including one near Scottsdale Fashion Square, are known for their vertical landscape gardens. The first phase includes 150 apartment units and a 12-story condo tower surrounded by walking paths, a pet park and landscaped courtyards. Remaining construction will include additional residential units, or possibly a hotel. About a quarter-mile north of Kierland Commons, the five-story Overture Kierland active adult community is under construction. The site was most recently a vacant furniture store. Overture Kierland will include a full-time activities director and professional concierge, said Omar Rawi, director of development for developer Greystar, in an email. Residents will move in next year, he said. Greystar chose the site for its proximity to amenities like the freeway, golf courses and retail, Rawi said.